The crankshaft, sometimes casually abbreviated to crank, is the part of an engine which translates reciprocating linear piston motion into rotary motion. 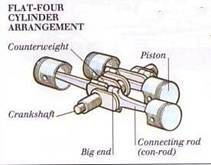 To convert the reciprocating motion into rotation, the crankshaft has "crank throws" or "crankpins", additional bearing surfaces whose axis is offset from that of the crank, by which the "big ends" of the connecting rod for each cylinder attaches and imparts its downward motion into the shaft. It typically connects to a flywheel, to reduce the pulsation characteristic of the four-stroke cycle, and sometimes a torsional or vibrational damper at the opposite end, to reduce the torsion vibrations often caused along the length of the crankshaft by the cylinders farthest from the output end acting on the torsional elasticity of the metal. 1) Strength. Engine bearings are constantly subjected to tremendous forces from the thrust of the power strokes. The bearings must be able to withstand these loads without spreading out or cracking. 2) Corrosion. The bearing must be resistant to moisture and acids that always are present in the crankcase. 3) Antiscuffing. The bearing surface should be able to absorb enough oil to keep It from scuffing during startup, or any other time when It must run momentarily without an oil supply. (4) Embedabillty. The surface of the bearing must be soft enough to allow particles of foreign matter to embed themselves and prevent damage of the shaft journal. (5) Conformability. The bearing must be able to conform or fit itself to the surface of the crankshaft Journal. (6) Conductivity. The bearings must be able to conduct heat to the connecting rod so that they will not overheat. (7) Resistance to Heat. The bearing must be able to maintain all of these characteristics throughout its entire operating temperature range. a. General. The crankshaft is supported in the crankcase and rotates in the main bearings. The connecting rods are supported on the crankshaft by the rod bearings. b. Construction. Crankshaft bearings are made as precision inserts. They simply slip into place in the upper and lower halves of the shells. When the halves are clamped together, they form a precision bearing that will be a perfect fit for a properly sized shaft. The bearing inserts and the mating surface that hold them must be sized perfectly. The insert merely slips into place and is held from turning by the locating tab. c. Materials. Most bearings begin with a steel backing to give them rigidity. The lining then is applied to the steel backing. The lining usually consists of an alloy of copper, tin, and lead. The lining also may be made of babbit. Babbit is a popular bearing material that is an alloy consisting of copper, tin, and antimony. The lining thickness usually ranges from 0.002 to 0.005 in. (0.051 to 0.127 mm). The bearing then is coated with either aluminum or tin to a thickness of approximately 0.001 in. (0.025 mm). d. Bearing Requirements. Bearings must be able to support the crankshaft rotation and deliver power- stroke thrusts under the most adverse conditions. A good bearing must have the following qualities. e. Connecting Rod Lubrication. The connecting rod bearings fit into the lower end of the connecting rod. They are fed a constant supply of oil through a hole In the crankshaft Journal. A hole in the upper bearing half feeds a passage In the connecting rod to provide oil to the piston pin. f. Crankshaft Main Bearings. The upper halves of the main bearings fit right into the crankcase, and the lower halves fit into the caps that hold the crankshaft in place. The main bearings have holes drilled in their upper halves through which a supply of oil is fed to them. The crankshaft has holes drilled in the journals that receive oil from the main bearings to feed the rod bearings. It is a common practice to cut a groove in the center of the main bearing Inserts. This supplies a more constant supply of oil to the connecting rod bearings. One of the main bear- Ings also serves as a thrust bearing. This controls back and forth movement of the crankshaft. This thrust bearing is characterized by side flanges. 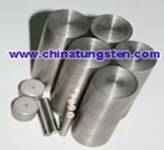 Tungsten Heavy Alloy is superior to lead in terms of durability, dimensional stability, high density, well wearing resistance and low toxicity. Therefore, tungsten alloy products are used extensively to balance crankshafts in high performance engines. Individual weights are stocked. You can see more details on crankshaft. So if you have any interest in tungsten alloy, please feel free to email us: sales@chinatungsten.com sales@chinatungsten.com or call us by: 0086 592 512 9696, 0086 592 512 9595.